Russians say that V-Day is a holiday which everybody celebrates with tears in their eyes, since the Soviet Union has paid too dear a price for its victory over Nazi Germany in the war of 1941-1945, with millions of Soviet troops having fallen on the battlefields. Memorial services are held in all Orthodox churches in Russia on Victory Day. During the war years the Russian Orthodox Church prayed for the victory over the enemy. One of those who prayed was a great hermit Seraphim of Vyritsa. When the Second World War broke out, Father Seraphim was 75 and living out his days in a small village Vyritsa, near Leningrad (now St.Petesburg). Before the Germans moved in the local residents asked him if they should leave for the areas further east or stay in their home place. Father Seraphim, known for his astuteness, told them to stay, since Vyritsa would survive the invasion, all the houses would remain intact and no resident would die. Indeed, when Germans entered the village in September 1941, they killed no one and plundered no household. 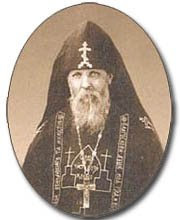 At that time Father Seraphim prayed day and night for the salvation of the residents’ souls, for saving the village and its church named after the Icon of the Mother of God of Kazan. The church was the only one in the vicinity of the frontline that conducted services. The invaders had no objections to public worship. What’s more, the enemy unit that was deployed in Vyritsa, was made up of Orthodox Rumanians (Hitler’s allies). They spoke a little Russian, understood divine services in Church Slavonic and would often attend the services at the church of the Icon of the Mother of God of Kazan. The unit chief was a German captain. When the soldiers learnt about the astute old monk, they would often come to see him and ask just how the war would end, and if Hitler would win. Father Seraphim was quite outspoken and said that Hitler would never defeat Russia and that German would never capture Leningrad. Also, he predicted that the German captain would die in Poland and would never get back home. …Many years later an elderly Rumanian who was part of the Vyritsa-deployed unit came to the village and said his chief had died in a place near Warsaw, just as Father Seraphim had said. The old monk kept saying that Germans would soon leave, since they were guests, and guests normally do not stay long and leave for home. Someone informed on him and the commandant ordered that Father Seraphim should be killed. When soldiers burst into his house, the old monk said: “Oh, the assassins are here! But who are you going to shoot at? Do you see that Cross with the Saviour on it that I wear. So you will shoot at Christ. How can you say then that are believers?” He said all that in German, which he learnt in Germany, a country he frequently visited on business many years before. After that he told each soldier how many children the latter had: “You have two children, and you have three kids.” The soldiers did him no harm but reported the situation to the commandant, who countermanded his order. To save the country and its people from death during the war Father Seraphim accomplished a very special feat: for 1,000 nights did he pray before an Icon of his heavenly protector St. Seraphim of Sarov, kneeling on a stone in his garden. And there should be no doubt that the prayer of the old monk, just as the prayers of other people, reached the ears of those they were meant for. Our Lord Jesus Christ did help Russia to defeat the enemy. The war was still in full swing, when the old monk began to ponder on the post-war life, giving advice on what should be done once the fighting was over, elaborating on the need for re-building churches and monasteries, on restoring the Orthodox faith.